The permafrost soil of Mo-he in Northeast China presents a typical cold environment colonized by psychrophilic microorganisms. This study is aimed at assessing the bacterial communities of permafrost soil of Mo-he in China by sequencing the 16S rRNA genes and Mothur analysis. PCR products with universal 16S rRNA gene primers were cloned and partially sequenced, and bacterial identification at the species was performed by comparative analysis with the GenBank/EMBL/DDBJ database. A total of 266 clones were obtained with the average length of 1,050 bp. Mothur analysis showed that the coverage value of clone library was 53.78 %, Shannon diversity (H) was 4.03, Simpson diversity value was 0.018, and 74 operational taxonomic units were generated. Through phylogenetic assignment using BLASTN by more than 97 % similarity, a total of 87 tentative taxa were identified. 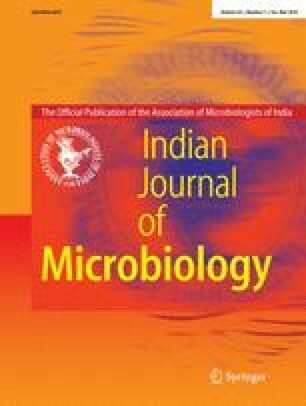 The majority of bacterial sequences recovered in this study belonged to the Acidobacteria, Proteobacteria, Verrucomicrobia, Bacteroidetes, Chloroflexi and Chlorobi. Among them, Acidobacteria are dominant community, accounting for 30.1 % of total bacteria, followed by Proteobacteria which accounted for 22.2 %. This result reflected the acidic characteristics of the permafrost soil of which pH value was 6.0. Our study indicated that the permafrost soil of Mo-he in China has a high diversity of bacteria and represents a vast potential resource of novel bacteria. As far as we knew, this is the first report on bacterial diversity of permafrost soil of Mo-he in China. Dong Dan and Dian-peng Zhang equally contributed to the manuscript. The online version of this article (doi: 10.1007/s12088-013-0420-1) contains supplementary material, which is available to authorized users. The work was supported by Beijing Natural Science Foundation (No. 6101001) and Science and Technology Innovation Foundation from Beijing Academy of Agriculture and Forestry Sciences (No. KJCX201101001).